The summer is on its way, and we are still getting wedding invitations. 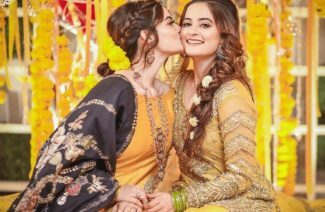 Summer weddings are a tad complicated, in terms of what to wear in the blistering heat. 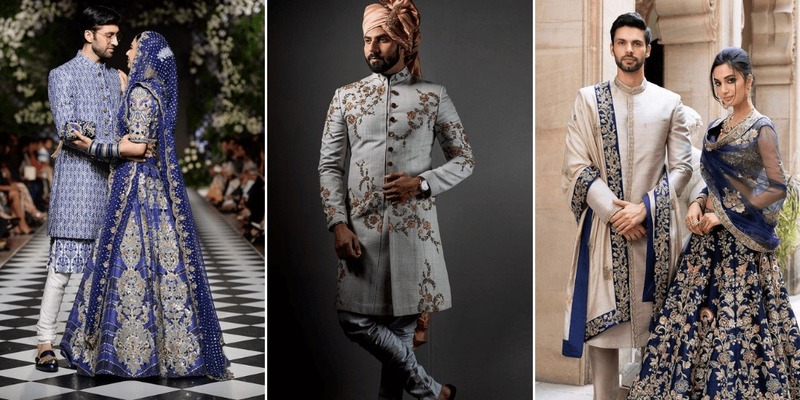 The brides have their pick of the dress ideas, and grooms-wear designers are working on unique palettes to create new, unprecedented standards for desi men’s fashion. 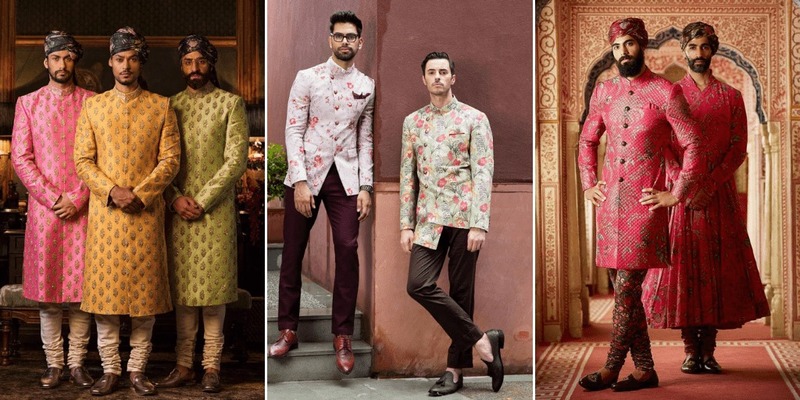 If your wedding is arranged to happen this summer, and you are looking for the trendy idea to incorporate in your dressing on your day as the man of the hour, we have brought you the most happening color palettes that are being worn by grooms these days. From what we have gathered from the menswear designers in 2019, it is apparent that desert colored palette with tones of sepia, almond, and beiges being highlighted from the tan colors. It is a bold choice by designers to choose muddy colors in the heat. However, they are look pretty regal, as you can probably see. 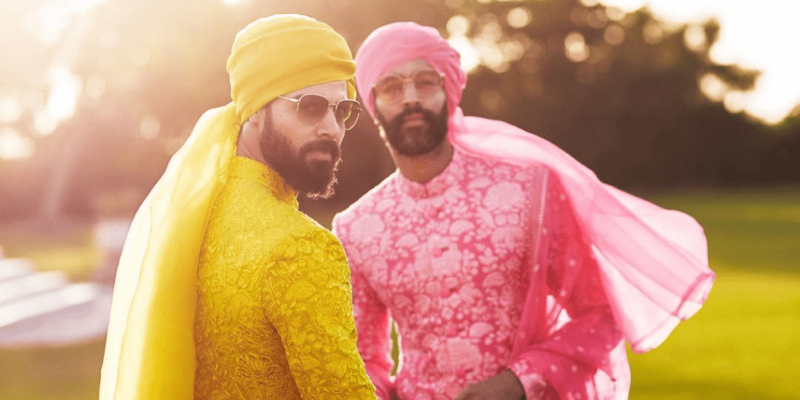 Apparently, the bridal designers’ love for the floral gowns, is now taking a new twist in the world of men’s fashion. 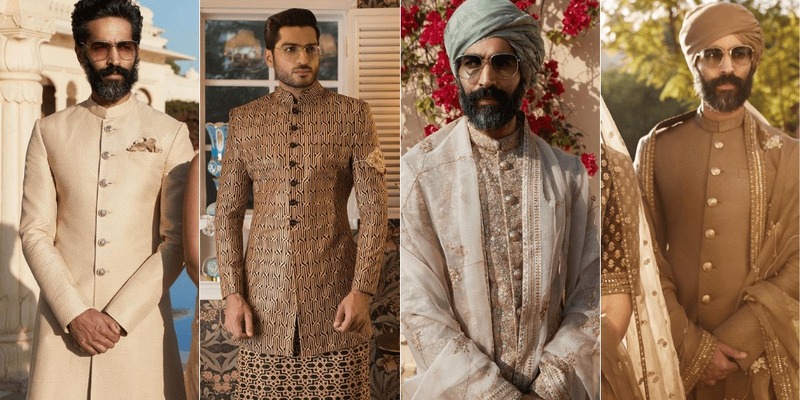 Since it been fairly popular for brides and grooms to coordinate outfits, the floral printed and embroidered sherwani’s are also getting immense popularity. And somehow men are making these floral works, without looking feminine. Black is always a great color for every era, every weather, and any time of the day. 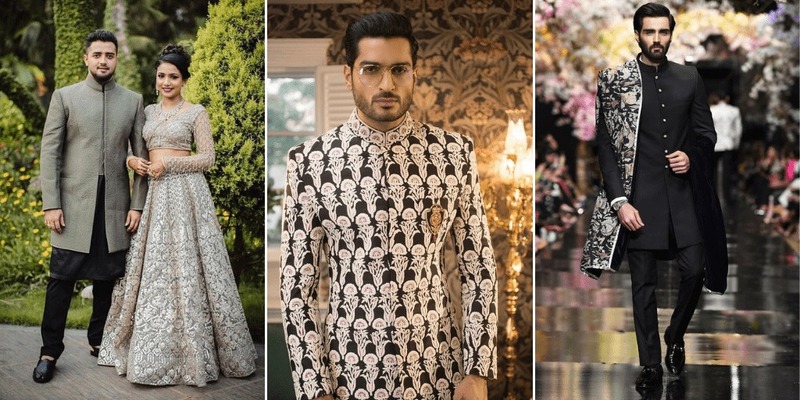 Black sherwanis will never be out of the trend and will continue busting the myth that one shouldn’t wear black at a wedding for it being the color of mourning. The black sherwani is elegant and graceful that gives the grooms a hint of mystery. The mint greens and sage colors are also very popular in the bridal world recently. The lent such a fresh vibe that people find very soothing to the nerves. 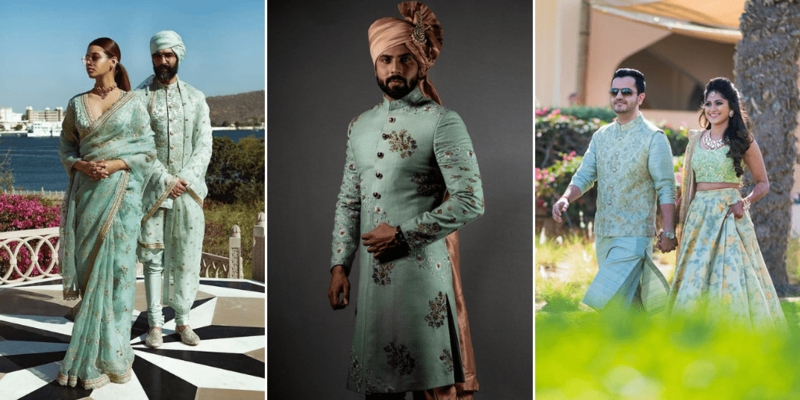 Mint green sherwanis are perfect for day time weddings or intimate weddings where you are trying to avoid the flash. They are also a great pick for recently wed men at the wedding of a beloved relative. The palette blue is another one that’s staying for the summer, even though it made quite an appearance in winter as well. However, the brighter blues are such a summer color that leaves a pleasant impression in the minds of those who wear it. Grooms can never go wrong with a nice blue outfit, as it will serve them forever. Blue can be both flashy, and conservative; it all depends on your personal sense of style. You can play with it however you please. 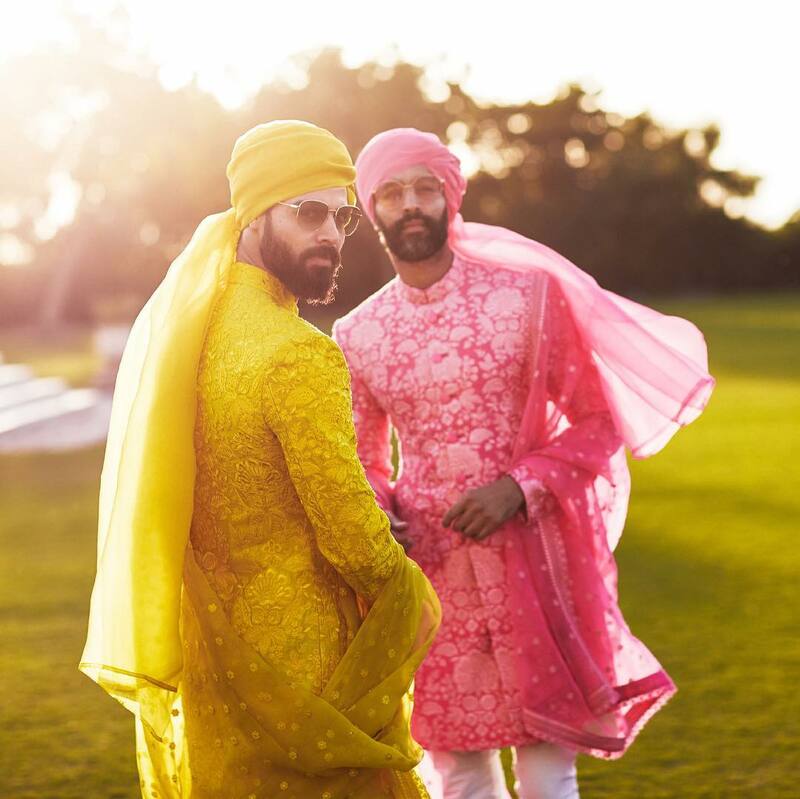 The modern-day Midas of designers; Sabyasachi introduced his bridal and grooms wear collection of 2019, and it included these bold neon sherwanis. Undoubtedly, they are flashy beyond words. Yet they somehow work, if you carry them with the right attitude. 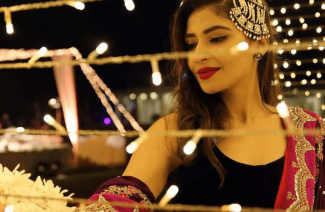 Recently Karan Johar was spotted wearing one at the Ambani wedding. Which palette is most likely to whet your appetite after this?